You're probably thinking, hey, what's this? A toy? Isn't this a column about kid and family friendly video games? Well, yes, it is. But is there any thing more kid friendly than a toy? Certainly there is not, especially when the toy is based on a fantastic video game. As soon as we learned about the existence of Halo Wars Mega Bloks, it was a foregone conclusion that we'd own them. Building our own Halo vehicles, with adorable little soldiers inside, is a lot of fun, and was certainly a cooperative effort! Long time readers of the site might recall my youngest boy's love of Halo, particularly Master Chief. Just before school started back up, a friend showed him a tiny, cute, but highly detailed and well articulated Spartan, about two inches tall. We tried to find them, checking several stores, but even the always reliable Toys R Us let us down. They weren't even available online for a while. When I went to pick up my copy of Halo 3 ODST there, though, not only were they back in stock, but on sale, buy two get one free. Figuring it'd be a good time to stock up, I walked out with two armfuls of Halo stuff. The first product we opened was the Battle Unit. This pack didn't include any building blocks at all. Instead, it's a set of eight little figures. There are two Spartans, and two Flame Marines, one each of green and blue. The "bad guys" are two purple Covenant Elites, and two Grunts. I was very surprised at the quality of this set. 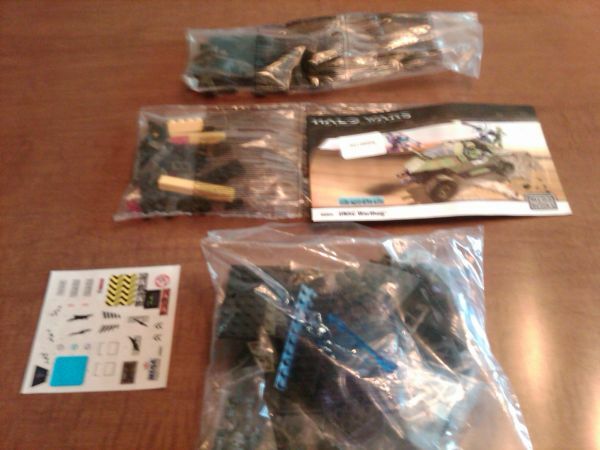 The figures are very nicely detailed, and sport excellent paint jobs. They are similar to LEGO figures, but they don't share a common mold; each figure has a unique sculpt and is more realistic. (For imaginary soldiers and aliens from a video game, that is.) The Elites have hooked legs, and the Grunts are tiny and ugly. They even have some itty bitty weapons to wield against each other. Being so small, these little figures fit right in a pocket for some action on the go. 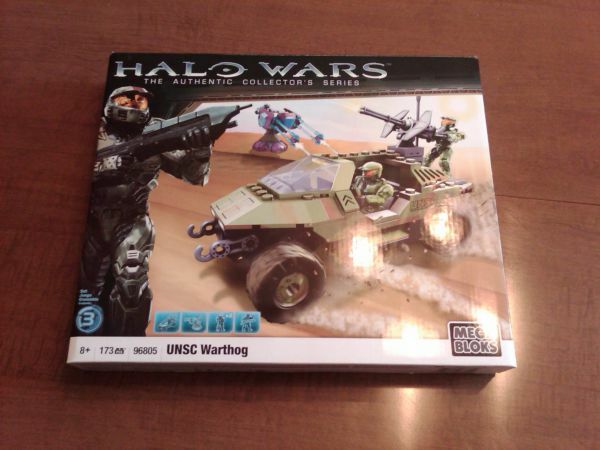 My son had a great mid quarter report card, so as a reward, I dug out the UNSC Warthog set and gave it to him. The Warthog is his favorite vehicle in the game, and he was quite excited. We opened up the box and looked at the contents, and the first thing we said to each other: "Wow, that's a lot of parts!" Truly, it would take a team effort to complete this set.